Thirteen-year-old Junie wants desperately to be a writer. 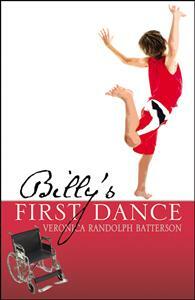 Her younger brother Billy is confined to a wheelchair and wishes he could dance. Their quirky family provides love in this coming of age and special needs novella. Set in the southeast in the 1970s, Billy’s First Dance unfolds with attention to family bonds, special needs and coming of age. Junie wants desperately to become a writer but must deal with the unusual circumstances of her family. She and her three half siblings live with their grandmother and aunt, and none of the children know where their mother is. This is a little story that packs a great deal of emotion between its pages. Funny and moving, readers should be ready to laugh and cry. A wonderful read! I really enjoyed this book. I can't wait to share it with my nieces and nephews. This children's book reminds me of Because of Winn-Dixie and The Secret Life of Bees. I absolutely loved it! This book captures every aspect of adolescence and is truly moving. A great read for both children and the young at heart. A charming tale and wonderful characters: Junie, Billy, Wisteria and Tommy.